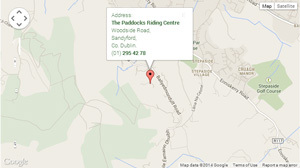 Contact - Horse Riding Centre Dublin, riding lessons, livery, horses riding school, stables, pony trekking, equestrian centre, Dublin Mountains, Wicklow, Ireland. 44 Bus, Larkhill to Enniskerry. Get off at Stepaside stop. 20 min walk from Stepaside to the stables. Please see map below for further directions. 44B Bus, Dundrum Rd-Ballybrack Rd Hillview. Get off at stop 19. 5 minute walk from stop to the stables. Please check Dublin Bus website for bus schedule. Green Line Luas, St Stephens Green-Sandyford. Get off at Sandyford stop. The stables are 10 minutes away by car. We take care to provide suitable and safe horses and ponies for our customers, but animals can be unpredicable. We strongly advise you to take out full personal accident cover.